Studying at university offers a chance for students to not only further their education and kick start their career, but for many it’s the first step to adulthood and independence. With so many options to choose from – it can be a daunting prospect to find the perfect fit. Look no further, as AppJobs has ranked the world’s top cities on a variety of key factors to create the ultimate index for students who are still deciding on which city to study in. 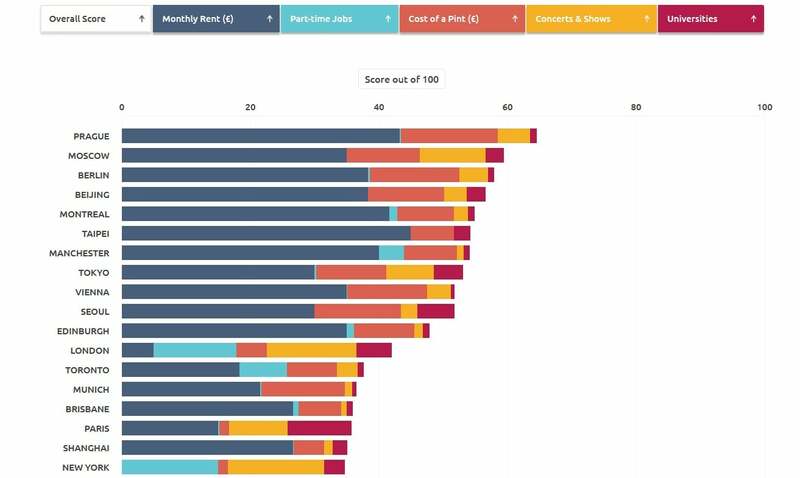 By compiling rent prices, the number of universities in each city, the number of part-time jobs on offer, the number of concerts and shows and the average cost of a pint, AppJobs has pinpointed the best cities in the world to study. So will you be catching a flight to attend university? Prague comes in as the best city to study at university, and also tops the leaderboard for having the cheapest pint of beer at £1.23. This is nearly five times less than London which is £5.31, coming in as the 10th most expensive city for a beer. The city is also known for how picturesque it is, receiving a whopping 7.65 million tourists in 2017. Ranking as the second cheapest location for monthly rent, Prague allows students to experience what it’s like to study in a major city whilst also living an affordable lifestyle. With many students concerned about budgeting, research by AppJobs reveals the cities that are the best for reducing money worries by looking at the cheapest locations to rent property. Prague and Berlin feature again in the top 5, and Manchester - one of the liveliest cities in the UK - comes in at 4th. With nearly 100,000 students studying across four different universities, Manchester is a top destination to study and have a good social life whilst on a budget. It’s no secret that, for many students, nightlife and entertainment is one of the key factors in deciding where to go to university. AppJobs’ research reveals that if students want to experience the most lively evening entertainment, they should go nowhere other than the Big Apple. If you’re currently living in Europe and America is slightly further afield than you’d planned to go for university, the UK’s capital city London came in a close second. Moscow, Paris and Tokyo should also be at the top of your list for cities to study if nightlife is what you’re most looking forward to! Are you planning on going to university in the next couple of years? Take a look at the index to see the university that could be best for you here.